A quick no-bake version of the heritage American recipe. 1 Melt Spread in large skillet over medium-high heat and cook mushrooms and onion, stirring occasionally, 5 minutes or until vegetables are golden. Reduce heat to medium. Stir in garlic and flour and cook, stirring constantly, 2 minutes. Whisk in broth and Hellmann's® or Best Foods® Real Mayonnaise; bring to a boil. Reduce heat and simmer, stirring occasionally, 2 minutes or until thickened. 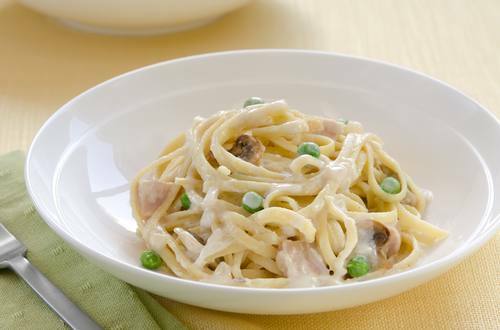 2 Stir in turkey, linguine, peas and cheese and cook 2 minutes or until heated through. Season, if desired, with salt and pepper.